Provide comfort for the family of Robert Brooks with a meaningful gesture of sympathy. Lincoln – Robert “Bobby” Waldo Brooks, 90, passed away peacefully, March 16, 2019 at Colonial Health Care in Lincoln. He was born May 12, 1928 in Forest City, the son of Harry E. and Helen (Coburn) Brooks. Bobby graduated in 1946 from Mattanawcook Academy where he met his wife of 70 years, Winifred Louise (Lancaster) Brooks. In February of 1952 he joined the United States Army and was stationed in Germany during the Korean Conflict. For over 35 years he worked for Lincoln Pulp and Paper, where he retired. Bobby and Winifred owned Candyland on Main Street in Lincoln for over a decade, where they met many friends – young and old. After retirement he was known for puttering around and taking care of the South Lincoln Neighborhood. Bobby enjoyed mowing the lawn and taking care of yard work. Taking rides to get some ice cream or a hotdog from Harris’ Take-Out was one of his favorite pastimes. In addition to his parents he was predeceased by a brother, Paul Brooks and a special cousin, Waldo “Bud” Brooks. He is survived by his wife of 70 years, Winifred of South Lincoln; two daughters, Wanda McLaughlin of Chester, and Janice Brooks-Calhoun of Orrington; three grandchildren, Jill McLaughlin of Hampden, Julie Peters and her husband, Derek of Rochester, NH , and Micheal McLaughlin of Lincoln; three great-grandchildren, Hayden, Owen, and Benjamin Peters of Rochester, NH; wonderful neighbors, Gary and Gilda LaChance, and Reggie Drinkwater, all of South Lincoln; as well as many nieces, nephews, and cousins. Friends are invited to visit with the family 6-8P.M. Friday, March 22, 2019 at Lamson Funeral Home, Clay Chapel, 7 Lee Road, Lincoln, where funeral services will be held 2 P.M. Saturday, March 23, 2019. Spring interment will be at the Lincoln Cemetery. 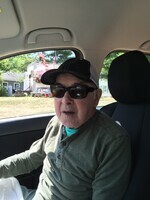 Those who would like to remember Bobby in a special way may make donations in his memory to Woodie Wheaton Land Trust, 2 Grove Road, Forest City, ME, 04413 or The Multiple Myeloma Research Foundation P.O. Box 414238, Boston, MA 02241-4238. To plant a memorial tree in honor of Robert Waldo "Bobby" Brooks, please visit our Heartfelt Sympathies Store.